We have had a number of enquiries from technicians about which types of face masks are most suitable for use by the majority of Cosmetic Tattooists and requests for our opinion if the transparent mouth shields (partial shields) that have recently found their way into the market place are suitable PPE for skin penetration / cosmetic tattooing services, hopefully this publication will clarify the situation. In December 2015, Standards Australia published AS 4381: 20151 which is an updated version of the standard for single-use face masks for use in health care, the new standard is intended to harmonise with the North American standard ASTM F2100-11 and European standard (EN) 14683. Products which are supplied in Australia need to comply with AS 4381: 2015 if they purport to provide the protections described within the standard. e.g. For general purpose procedures, where the wearer is not at risk of blood or bodily fluid droplet or splash. e.g. For procedures where minimal blood droplet exposure may possibly occur. Procedures where there is a risk of blood or bodily fluid splash. Risk of transmission of minor respiratory infections from the client to the technician - e.g. Level 1 Mask. Risk of minor respiratory infections from the technician to the client - e.g. Level 2 Mask (higher Differential Pressure for coughing/sneezing etc). Risk of transmission BBCD from client to technician via minimal blood droplet exposure (adequate for most cosmetic tattoo services) - e.g. Level 2 Mask (higher Bacterial Filtration Efficiency and Fluid Resistance). 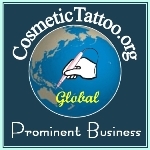 Risk of transmission BBCD from client to technician via minimal blood splash exposure (cosmetic tattoo services with some machine types e.g. coils4) - e.g. Level 3 Mask (higher Fluid Resistance). 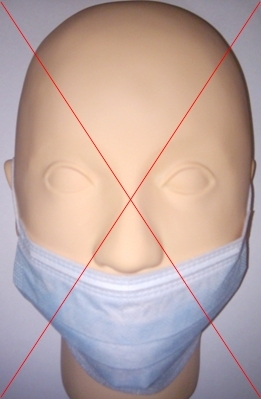 You can see from the above that the protection provided by the use of surgical face masks is largely dependant upon the filtration capacity and fluid resistance of the mask and the selection of protection level is dependant on the type of procedure and risk assessment of the procedure. Q: Are transparent mouth shields a suitable alternative to disposable surgical face masks for cosmetic tattoo services? Most TMS products that we have encountered appear to focus on the fashionability, comfort, anti-fog and ease of use characteristics rather than the primary purpose of a surgical mask i.e. bacterial filtration and fluid resistance. We have not seen a TMS product that states it is in compliance with AS 4381: 2015. We have not seen any TMS product that has approvals or exemptions from the Therapeutic Goods Administration. Most TMS products are promoting re-use (increases risk of fomite mediated cross contamination). We have seen no credible evidence that a TMS product affords the same level of protection as a surgical face mask that is compliant with AS 4381: 2015. NB. 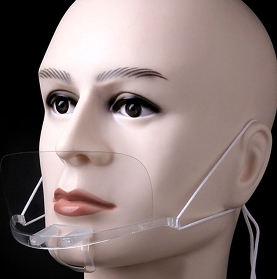 Transparent mouth shield's should not be confused / compared with with full face shields which are sometimes used in high risk procedures in conjunction with Level 3 surgical face masks. Q: What type of mask do the experts in disease control recommend? CDC: "Masks should fully cover the nose and mouth and prevent fluid penetration. Masks should fit snugly over the nose and mouth. For this reason, masks that have a flexible nose piece and can be secured to the head with string ties or elastic are preferable." Q: Which type of mask is most suitable for cosmetic tattoo services? Centers for Disease Control and Prevention. Guidance for the Selection and Use of Personal Protective Equipment (PPE) in Healthcare Settings. Copyright © 2017 CosmeticTattooist.com All Rights Reserved. No copying, transmission or reproduction of site content is permitted without our prior written consent.